Maxon's compact drives feature controllers, sensors and motors in a modern aluminum casing. The use of existing maxon products with an adapted design results in robust, space-saving drive solutions with high power density. The decentralized concept of these intelligent drives minimizes the use of centralised controllers. 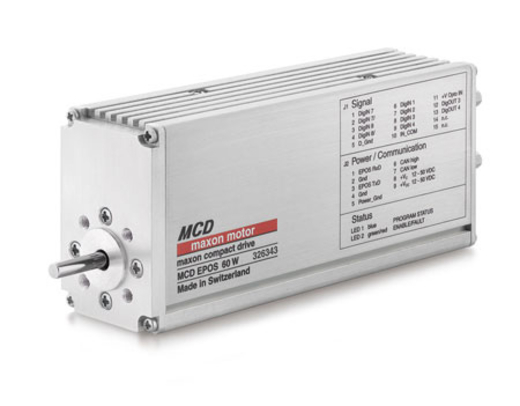 The combination of the brushless maxon EC motor, digital MR encoder and the fully digital EPOS positioning controller results in a highly dynamic, maintenance-free positioning drive with excellent functionality and high efficiency. Planetary gearheads can be selected from the maxon gear programme as an option for greater torque. The MCD EPOS is fitted with several opto-coupled inputs and outputs. Sensor signals and events can be evaluated directly in the drive. Cable lengths are shorter, thus reducing susceptibility to interference. Drive commanded by graphic user interface with many functions and wizards for start-up procedure, automatic control settings, I/O configuration and tests.